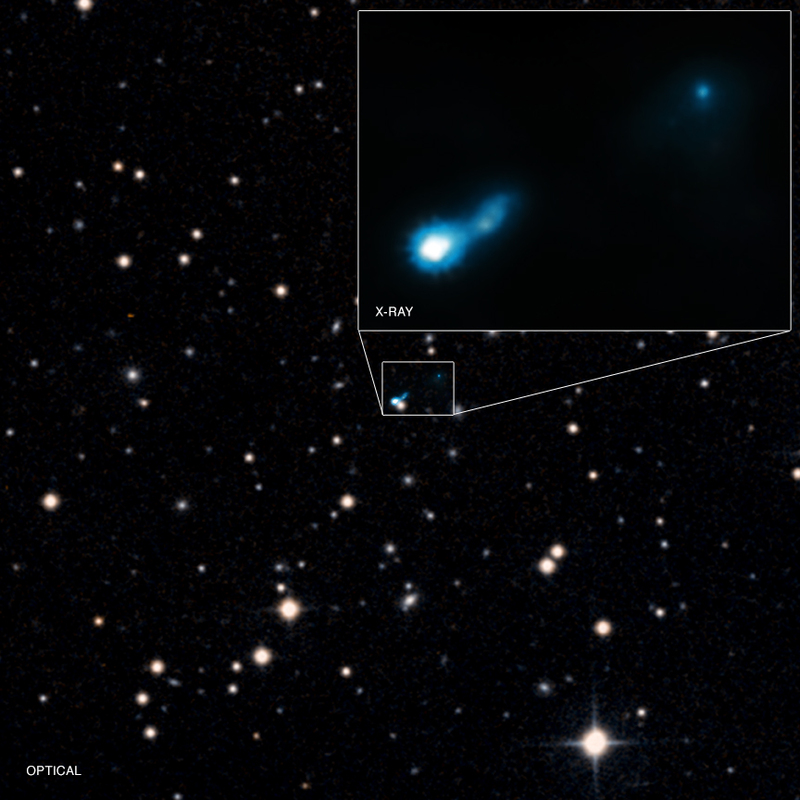 A jet from a very distant black hole, called B3 0727+409, has been found using the Chandra X-ray Observatory. The light from this jet was emitted just 2.7 billion light years after the Big Bang when the Universe was only one fifth its current age. Jets in the early Universe such as this one give astronomers a way to probe the growth of black holes at a very early epoch. Typically, such distant jets are discovered in radio waves first, but not B3 0727+409 that was first found by Chandra. A jet from a very distant black hole being illuminated by the leftover glow from the Big Bang, known as the cosmic microwave background (CMB), has been found as described in our latest press release. Astronomers using NASA's Chandra X-ray Observatory discovered this faraway jet serendipitously when looking at another source in Chandra's field of view. 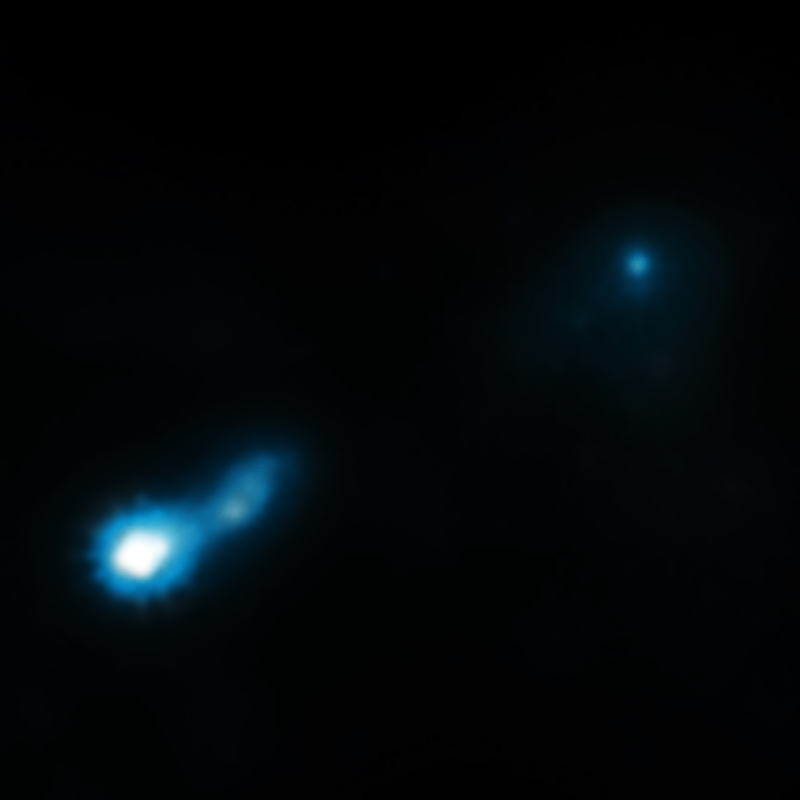 Jets in the early Universe such as this one, known as B3 0727+409, give astronomers a way to probe the growth of black holes at a very early epoch in the cosmos. The light from B3 0727+409 was emitted about 2.7 billion years after the Big Bang when the Universe was only about one fifth of its current age. The inset shows more detail of the X-ray emission from the jet detected by Chandra. The length of the jet in 0727+409 is at least 300,000 light years. Many long jets emitted by supermassive black holes have been detected in the nearby Universe, but exactly how these jets give off X-rays has remained a matter of debate. In B3 0727+409, it appears that the CMB is being boosted to X-ray wavelengths. Scientists think that as the electrons in the jet fly from the black hole at close to the speed of light, they move through the sea of CMB radiation and collide with microwave photons. This boosts the energy of the photons up into the X-ray band to be detected by Chandra. If this is the case, it implies that the electrons in the B3 0727+409 jet must keep moving at nearly the speed of light for hundreds of thousands of light years. The significance of this discovery is heightened because astronomers essentially stumbled across this jet while observing a galaxy cluster in the field. Historically, such distant jets have been discovered in radio waves first, and then followed up with X-ray observations to look for high-energy emission. If bright X-ray jets can exist with very faint or undetected radio counterparts, it means that there could be many more of them out there because astronomers haven't been systematically looking for them. A paper describing these results was published in the 2016 January 1st issue of The Astrophysical Journal Letters and is available online. The authors are Aurora Simionescu (Institute of Space and Astronautical Science, Kanagawa, Japan), Lukasz Stawarz (Jagiellonian University, Kraków, Poland), Yuto Ichinohe (Institute of Space and Astronautical Science, Kanagawa, Japan), Teddy Cheung (Naval Research Laboratory, Washington, DC), Marek Jamrozy (Jagiellonian University, Kraków, Poland), Aneta Siemiginowska (Harvard-Smithsonian Center for Astrophysics, Cambridge, MA), Kouichi Hagino (Institute of Space and Astronautical Science, Kanagawa, Japan), Poshak Gandhi (University of Southampton, Southampton, UK) and Norbert Werner (Stanford University, Stanford, CA). Coordinates (J2000) RA 07h 30m 48.00s | Dec +40° 51´ 10.00"
Observation Time 5 hours 33 min. A black hole with an X-ray jet about 11 billion light years from Earth. About 11 billion light years from Earth. X-rays from the Chandra X-ray Observatory with optical data from Digitized Sky Survey. 16 million light years across.